Click on each topic and it will expand to show you the information you need. You can find our Club Rules here. All our ‘official’ club rides and other events are listed on the Calendar. The calendar is regularly updated by our ride leaders, sometimes with last minute additions. Details of the ride leaders, grade of ride, the meeting time/place, and a brief description of the route are provided. For Club members there is no need to contact the ride leader beforehand, just turn up at the required time/location. For non Club members, in order to comply with our insurance, there is a requirement to provide their name, address and phone contact details. In order to avoid disappointment non members are advised to contact the ride leader before the ride commences, using this link The rides are listed as a summary, but you can click on each one to see more detail. You MUST wear a helmet. This is not negotiable. A bottle of water and a snack can really help. This is certainly the case on rides longer than an hour. If you are new to cycling or returning after a long break then you may need to drink more than you expect. Bring some anyway. Even on easy short rides you might get a bit sweaty, so dress in layers that you can add/remove. For example, shorts/leggings + t-shirt/top + jacket. You may need to remove layers, so work out how you are going to carry them. Gloves are great for two reasons. They keep out the cold, especially on chilly days or when it gets late. They also help if you come off, as your hands generally take the brunt of a fall. Shoes should be comfy and not slide off the pedals. High-heels and clogs have their place, but not on a bike. No danglies. Scarves, dresses, flares and other loose clothing could catch in the chain or snag a passing car. Do I have to be a member to join a ride? How do I know whether a ride will be suitable for me? All our rides are graded according to the distance, difficulty and terrain. Level 1 is the easiest, suitable for very early riders and children. Level 5 is the hardest (cross-country epics). Many of our rides are somewhere in the middle, but check the Calendar for actual details. You may also like to see more about our Grading System. If you are unsure look out for the Sunday saunter rides, whilst these rides are a little higher than level 1 they are taken at a very relaxed pace with a couple of short hills which you can walk up if necessary, we always stop for a breather. Just turn up and during the ride we’ll assess and chat about your level and can advise which rides would suit you most on subsequent rides. It’s a great way to get introduced to club rides. If you have any queries about a particular ride then please contact the ride leader who will be pleased to advise. Details on how to contact a ride leader has its own topic, shown below. 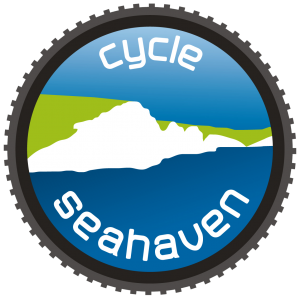 I acknowledge and accept that I participate in any Cycle Seahaven event at my own risk and that event organisers shall not be liable for any loss or damage caused to me or my possessions. In addition, I accept that it is my responsibility to ensure that I am fit for any cycle ride in which I participate and there is no medical reason that would prevent me from participating in the ride or event. Where do rides start from? We have a variety of starting points for our rides. The ride summary on our calendar should state the start point. Click HERE for additional description and a map of meeting locations. How will I know if a ride is cancelled due to bad weather etc.? If the weather looks iffy or there’s any doubt about the ride, then call the ride leader or check the online calendar. If rides or events have to be cancelled, ride leaders or organisers will update the online calendar as early as possible and no later than 1 hour before the start time. How do I contact a ride leader? Ride Leaders will usually give their mobile number or email with the ride description and will be happy to discuss any queries you have about a particular ride. It is a good idea to bring the ride leader’s contact number with you on a ride in case of delays getting to the start point or incidents on a ride. Bear in mind that mobile reception may be variable, especially off road or out of town. Use the following form to email a ride leader. Fill in your personal details, a subject and a brief message and we'll get back to you as soon as we can. How do I suggest a ride? If you fancy doing a particular ride then speak to a ride leader or use the contact form to send us your ideas, HERE, addressed to Campaigns in the Committee list with the heading Cycle Route Suggestions. We’re always keen to expand our knowledge of local routes for all abilities in and around the Seahaven area.